Pulling back the curtain further as to where inspiration for their characters comes from in the writing process, Nick, Simon and Edgar had a few thoughts as well: Where do characters come from? It’s clear the team really had fun putting this project together, drawing heavily on their personal experiences and their love for small towns; and, without giving away key elements, the unique nature of the story is sure to illicit laughs meanwhile leaving the audience stunned with rapid fire comedic dialogue. Oddly and unfortunately though, for all the fun, the final act seems to leave a rather odd taste afterword, not quite as rich as what seems deserved. Regardless, the first two thirds are sure to entertain and prove worthy of your entertainment dollar. 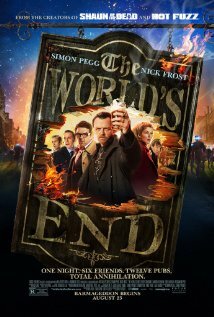 The World’s End is Rated R.
Returning home for their parents wedding anniversary the dysfunctional Davison family will have to band together to survive the night as a band of mysterious killers descends upon their house. All hope appears to be lost for Felix (Nicholas Tucci), Zee (Wendy Glenn), Crispian (AJ Bowen), Drake (Joe Swanberg), Kelly (Margaret Laney), Aimee (Amy Seimetz), Tariq (Ti West), Paul (Rob Moran), and Aubrey (Barbra Crampton); until Crispian’s girlfriend Erin (Sharni Vinson) shows her hidden talent for survival. No question, darkness will descend, but who will survive and why? Slasher, spatter, and splatter through and through this latest offering from Director Adam Wingard follows the rules of cinema horror to the T. Machetes? Yup. Piano wire? Yup. Crossbow? Uh huh. Really big axe? Yep that too. So…we’re not exactly scoring points in the death creativity department, something slasher fans are generally quite particular of. But, uncomfortable laughs o plenty, and quotable moments in spades make this ironically more fun than expected. In the fright department, a few jump scares spook the audience early on but the rest of the film plays out more suspense than scare, so it goes. If slashers are your thing, well here’s some decent B fodder. All others, eh, look elsewhere. 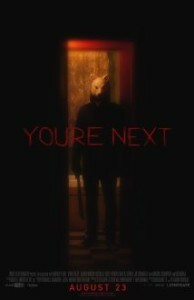 You’re Next is rated R.
Coming of age and moody as any teenager, Clary Fray (Lily Collins) is a little different than most girls her age; it appears her latest birthday has come with special supernatural gifts. As it turns out, Clary is actually a descendant of demon hunting warriors that protect our world. But, with this new found knowledge comes responsibility, and now that her mother (Lena Headey) has gone missing several problems will need addressing– rapidly. Specifically, in addition to finding her mother, Clary will need the help of her friends Jace (Jamie Campbell Bower), Isabelle (Jemima West), and Simon (Robert Sheehan) to locate and protect a powerful relic. Meanwhile the question of who is Clary’s father looms large, and where has he been all her life? Confusing in plot, Hollywood’s latest attempt to translate popular teenage fiction to cinema magic has the best intentions but instead bites off more than can be reasonably chewed in one sitting. Combining elements of Twilight, Star Wars, Underworld, and a gazillion other fantasy fiction story lines it’s hard to find an original idea on the page. Furthermore and disappointingly so, on several occasions what actually starts out as an interesting concept gets quickly reduced to a schlocky joke covered in teen cheese whiz, gross. On the other hand, visually there’s plenty to admire, and it’s not as though the actors are doing a bad job, it really does come down to stale plot, and an overstayed welcome. Clocking in at two hours and 10 minutes, knee jerk reactions say this should have been cut closer to the 100 minute mark, oh decisions. Maybe a matinee but more of a rental for the teens, just be prepared for Velveeta..ugg. 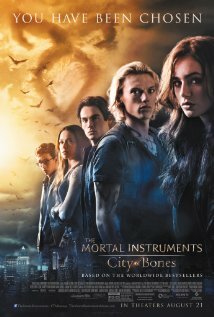 The Mortal Intruments: City of Bones is rated PG-13.